Larva just before pupating (31 days old). The only way it will exhibit the red lines toward its head is when the head is turned down slightly. Laying horizontally flat, I could not see the red lines. Over-wintered in fruit cellar. Adult eclosed May 5, 2005.
earlier instars? Can you check out ? I don't think this is an early instar Lappet. When I get a chance, I'll post the two earlier instars that I photographed. They aren't the greatest, but you will be able to tell that this caterpillar probably isn't a Lappet. Nothing in my data base matches it either. I found a caterpillar on page 476 of Caterpillars of Eastern Forests by Wagner that comes the closest, except for the cream-colored line down its back. 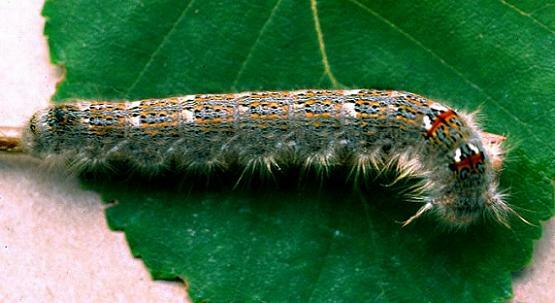 I doubt that that's it, but the "Blue-bumped Caterpillar" may be from the Lasiocampidae family. Hey! I like that name. It will be interesting to discover its REAL name. In the meantime, I'll keep this mystery caterpillar in mind. Actually, I have a few "mystery caterpillars" myself.